POSTED Tue, 11/24/2015 - 16:00 | POSTED BY Traci C.
Victoria & Albert's at Disney's Grand Floridian Resort and Spa has once again been named a AAA Five-Diamond winner for the 16th year in a row. Just. 0.2 percent of the 30,000 restaurants reviewed by AAA every year are awarded the AAA Five Diamond. 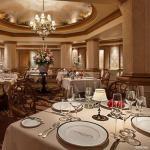 POSTED Mon, 05/12/2014 - 05:00 | POSTED BY Traci C.
For the 15th year in a row, Victoria & Albert's at Disney's Grand Floridian Resort & Spa has been named a AAA Five-Diamond Award winning restaurant. There are only 15 restaurants in North America with this distinction, and only 59 restaurants made the AAA Five-Diamond list, including 47 in the United States, six in Canada, four in Mexico, and one in the Caribbean. Nearly 30,000 restaurants are reviewed by AAA each year and 0.2 percent receives the Five-Diamond Award. Congratulations are in order for the staff of Victoria & Albert's. The Grand Floridian Resort & Spa's swanky restaurant earned a AAA Five-Diamond status - for the 13th consecutive year. AAA reviews some 28,000 restaurants; out of those, only 53 earned the Five-Diamond award. Victoria & Albert's also joins an elite group of 21 to have that honor for thirteen years running. That ever-popular restaurant situated in Disney's Grand Floridian Resort & Spa, Victoria & Albert's, has garnered yet another honor. Zagat has named the ritzy eatery to its list of top restaurants in the nation for 2012 and also has decreed it the best restaurant in Orlando. This latest honor joins a long list that has been bestowed upon Victoria & Albert's. The restaurant has received the AAA Five-Diamond award for the past twelve years - one of only three restaurants in Florida to nab the high rating. Victoria & Albert's, that ultra-posh restaurant at Disney's Grand Floridian Resort, has been given the 5-Diamond Award, the highest AAA rating honor offered for restaurants. The AAA 5-Diamond Award is a pretty high honor, indeed. Out of some 60,000 restaurants and lodging options reviewed nationwide, Victoria & Albert's is one of only three Florida restaurants with the rating. It also joins ranks with fifty-five North American restaurants to receive the award this year. Congratulations go out to Disney's Animal Kingdom Lodge this week for their recent achievement of the AAA Four-Diamond rating. This is a pretty lofty status the Animal Kingdom Lodge has garnered as only four percent of AAA-rated hotels are granted the Four-Diamond rating. To date, the Animal Kingdom Lodge is the seventh Walt Disney World resort to gain this status. Mother Nature can sometimes put a kink in the plans of even the most experienced traveler, but with a little pre-planning you can make sure that your family is prepared for anything. With a heavy winter storm bearing down on thirty-three states over this Thanksgiving weekend, it seems like a good time to revisit some of our previous articles on winter travel.